July 19, 2018: Salvatore Ferragamo Eyewear introduces the Salvatore Ferragamo Men’s Capsule, a new eyewear collection that combines modern design and flawless elegance in a distinctive range of sunglasses and optical styles for men. The brand’s artisanal flair and rigorous attention to detail is revealed in the sleek reinterpretation of vintage-inspired shapes and classical frames fashioned from smooth acetate and shiny metal. Each model is enhanced with exclusive contrasts and refined accents ranging from striped motifs and transparent effects to the iconic “Double Gancini” detail featured as a unique emblem of style and sophistication. A stylish mix of contrasting colors and materials characterizes the rectangular vintage shape with a metal front and bridge in a shiny gold finishing offset by the black or havana top-frame. The frame is equipped with ultra-thin acetate temples enriched with the signature “Double Gancini” element elegantly integrated in the hinge. Available in Black/Shiny Gold, Onyx/Shiny Gold and Havana/Shiny Gold. The classic aviator shape with metal double bridge is defined by a front Windsor rim construction, which is enhanced with tortoise and black tones that contour the blue, green or brown tinted lenses, to create an edgy and charismatic look. The style is fitted with slim temples embellished with the iconic “Double Gancini” emblem perfectly integrated into the hinge. Available in Vintage Tortoise, Tortoise and Black. Essential rectangular frame featuring a streamlined acetate structure with a shiny metal bridge. The style is offered in timeless, vintage color combinations including the contrasting mix of striped and solid acetates against green, blue or brown lenses. The iconic “Double Gancini” detail is skillfully integrated into the hinge to add an extra sophisticated twist to the classic design. Available in Striped Brown, Striped Honey and Black. An elegant and easy-to-wear round style crafted with an ultra-thin acetate frame with a key hole bridge. The timeless shape is rendered in a classic color palette that includes striped and transparent effects combined with green, blue or brown lenses for a unique vintage appeal. Slim temples enriched with the iconic “Double Gancini” element elegantly integrated into the hinge. Available in Khaki, Striped Grey and Brown. Sophisticated yet extremely versatile, this lightweight optical style features a rectangular shape with metal bridge and rims. The contrast between the shiny gold-toned metal and the acetate finishing in black, blue or havana adds an extra-touch of refinement to the vintage-inspired design. The frame is equipped with slim acetate temples personalized with the signature “Double Gancini” detail integrated into the hinge. Available in Black/Shiny Gold, Havana/Shiny Gold and Blue/Shiny Gold. The classic panthos shape boasts an elegant metal structure embellished with a subtle havana or tortoise Windsor rim around the lenses with slim acetate temples. Both sides are enriched with the iconic “Double Gancini” detail discreetly integrated into the hinges. Available in Vintage Tortoise, Tortoise and Grey Havana. The rectangular optical frame is defined by a subtle construction in acetate, heightened with a metal bridge design and the iconic “Double Gancini” element integrated into the hinges. The vintage inspired color scheme includes classic monochrome options and a striped version for a more graphic look. Available in Striped Brown, Tortoise and Black. This round shape in ultra-thin acetate is characterized by a keyhole bridge and slim temples detailed with the signature “Double Gancini” detail integrated into the hinge. The timeless design is enhanced with a color palette that includes transparent effects and a striped motif. Available in Tortoise, Striped Grey and Khaki. 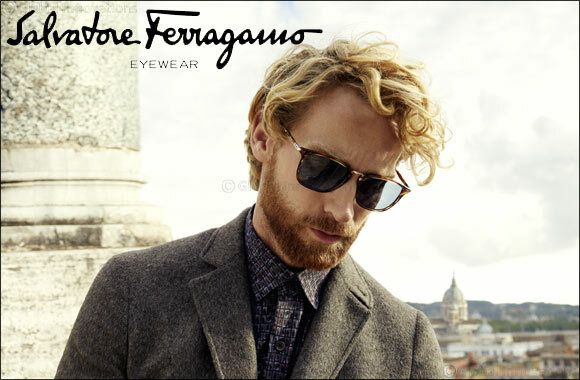 Salvatore Ferragamo Eyewear is produced under license by Marchon Eyewear, Inc., one of the world’s largest manufacturers and distributors of quality eyewear and sunwear.